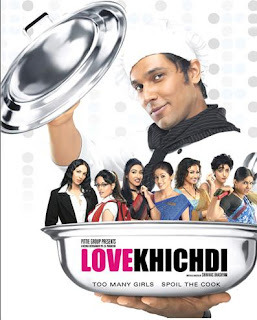 Love Khichdi is a romantic film, which revolves around a character Vir Pratap Singh (Randeep Hooda) is a man who, from small town, but with big dreams. He is currently working as a chef in a five-star hotel. Vir is a beautiful and charming man who wants to make them big in his dream city Mumbai. It seems that he lives his life as he is the man of every woman's dreams. Banner : Victoria Entertainment Pvt Ltd.
'Love Khichdi' is a romantic entertainer, directed by "Srinivas Bhashyam," the star casts Randeep Hooda, Riya Sen, Divya Dutta, Rituparna Sengupta, Sonali Kulkarni, Klapana Pandit, Jessy Randhawa, Saurabh Shukla & Sada in the lead roles . Music Director is Pritam who has given music in the blockbuster "Dhoom". "Vir Pratap Singh plays role" Randeep Hooda "a young, energetic, fun-loving bachelor from a small town, working as a chef in a five-star hotel in Mumbai. "Vir" is a playful young dude who likes to flirt with various ladies, the rediscovery of love with different women in different ways, but is not serious about the commitments, such as marriage. "Vir" has the ability to deal with all kinds of beautiful chicks that he had, whether it is human to hate his maid Santa Bai 'played by' Sonali Kulkarni, "or perhaps the strong powerful call Center Executive Nafisa Khan played by (Kalpana Pandit) or whether the Brainy beauty "Sharmista Basu (Ritupurna Sengupta) or whether it is a pretty girl" Parminder Kaur (Divya Dutta). It may be all the ladies fall for him. And on the other side "Vir" is supported by 'Sandhya Iyengar "a friend, he made for everything. Is "Vir" recognize the true love? Who will be the lady love of the "Vir"? Watch "Vir's hilarious show" Love Khichdi 'on the screen at 21 August 2009 [Just wait for 2 days].